This snap frame stand can hold 4 images! This FORTE snap frame stand is similar to our BP2228 except it holds four snap frames instead of just one! Each of frames holds a 22"x 28" poster or sign. 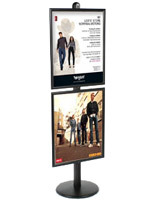 With this snap frame stand, you can promote your product, service, or company with 4 different posters, 2 of the same, or any other combination you can think of. 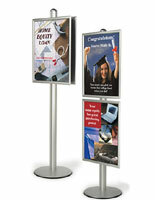 This FORTE snap frame display stand is one of our most solid, durable displays. 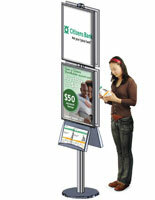 If you need a poster stand that will remain steadfast in busy areas, this is the display stand for you! 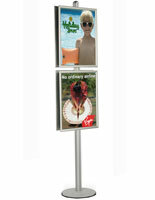 The combined weight of the pole and base is 25 lbs, making it difficult to knock around or move unintentionally. 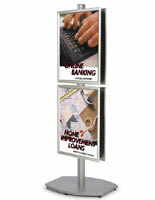 The snap frames make it simple to load your signs and graphics. Simply snap open the sides, cover it with the clear lens (provided) and snap shut. Adjusting the snap frame is easy as well. 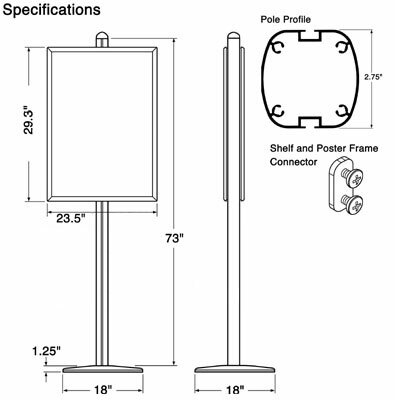 Slide them along the 73" pole and secure them to the height you desire.